Each year in February the questions from a variety of parents pick up. The senior parents are looking toward graduation and commissioning. I’ve added a few notes about the end of the year below. Tickets are limited. For the past several years each cadet gets 8 tickets. They can put their name in a lottery for extras but that is not guaranteed. Sometimes they can get a few from classmates who won’t use their allotment. Since tickets are limited to graduation some families rent a house and have the graduation live stream connected to a large screen TV for the guests who can’t be at the event. It is traditional to send out announcements for college graduation. Again traditionally announcements are sent to anyone who would want to know about this big life event. They are sent out the week of or after graduation. The recipient is not obligated to send a gift when they receive an announcement. It is a good time to announce the commissioning of a graduate who is entering the armed forces. You can also put a card with the new contact information for the graduate since they will no longer use the school’s address to receive mail. These small cards are referred to as “at home” cards to indicate the graduate will be at their new home after a certain date. The tradition of an at home card is an old one and has changed over time as to the meaning. You can read the history here. Many families use the online announcement company Signature. They are nice quality, but a better price than what Balfour offers. Commissioning services happen the Friday before graduation. Be in touch with your senior for the updated details on the ceremony. It is traditional for the newly commissioned second lieutenant to give the person who renders their first salute a silver dollar. You can usually find them online. For those commissioning they will have to order and pay for their dress uniform. That process is usually started by now. The expense surprises many parents. The seniors have to be out of the barracks by Thursday night of graduation week, unless they’ve requested and received an exception. Be sure you plan for this when making your accommodation reservations. Many families give their graduate a Lifetime Membership to the Citadel Alumni Association as a graduation gift. There is a special luncheon for the new Lifetime members during graduation week. Like most big weekends, graduation weekend is a time of great activity. Dress for the weather and for comfort in walking. If the weather is warm many ladies wear light dresses for the commissioning service and long gray line parade. The gentleman wear jacket and tie for the commissioning and more casual attire for the afternoon parade. For graduation, business attire is appropriate, a dress or nice slacks for the ladies and jacket and tie for the gentleman. Saturday morning arrive at the field house for graduation early to find a seat. In 2011 we were given assigned seats. The past several years it is open seating. Saving seats is discouraged. If you have young children attending, bring quiet distractions for them like coloring books and light snacks. The ceremony lasts about 3 – 3 1/2 hours. I played The Citadel version of “Where’s Waldo” with my daughter who was in 6th grade at the time her brother graduated. We had a list of my son’s friends and she tried to find them as they sat waiting for their name to be called. Have a plan of where you are to meet after the ceremony. Some families meet on the floor of the field house some meet outside the building. It is helpful to have a plan ahead of time. 2012 Bpnd Volunteer Aspirants march onto the parade field. photo by Stanley Leary. On occasion I am asked to help promote events. The Citadel Club of Charleston is hosting The Lowcountry Open event to benefit Palmetto Warrior Connection, a charity that supports veterans in South Carolina. While the club is the sponsor of the event anyone can participate. If you are in a position to be a sponsor, participant, or volunteer, please contact the leadership of the tournament and share this post in your circles. The tournament takes place after Spring semester ends so cadets can participate and/or volunteer as well. Registration opens this week. Late entry fees begin April 16. The Citadel Club of Charleston is the owner and host of The Lowcountry Open; a Charleston-based offshore, nearshore and inshore fishing tournament. Many committee members are directly connected to military services throughout the Lowcountry, the board unanimously agreed the charitable proceeds should benefit veterans. Palmetto Warrior Connection based in Charleston is the title charity for the event. 95% of charitable contributions to the Palmetto Warrior Connection goes to support veterans within South Carolina. We trust the sponsors will feel equally honored to help make this tournament a success! If you would like information about tournament sponsorship opportunities, or know someone who would be interested, please contact the Tournament Chairman: Ty Holland, ’95: info@thelowcountryopen.com. Additionally, you can see tournament and sponsorship details on the website, www.thelowcountryopen.com. Everyone is invited and welcomed as sponsors, anglers, spectators or volunteers. Winter furlough begins today for cadets at The Citadel. A time to celebrate to be sure. If your cadet needs academic support they should see the Academic Support Center the beginning of second semester. If the grades were really not up to standard, your cadet will need to communicate with their academic adviser and possibly the Dean. This page for Academic Advising FAQs may help answer a few questions. Throughout the year if you have a question about something on campus and you aren’t sure who to talk to on campus, you can ask a few people. Contact the parent liaison in the Provost office. The email and phone number are listed at the bottom of this page for Parents. The cadets should already know where to check for their report times back to campus on the training schedule. They should also be aware of all the information, including emergency contact numbers, listed in the Winter Furlough memo from the Commandant and Regimental Memos page. A list for parents of furlough dates and procedures can be found in the memo from the Commandant’s office. The link is on the Matriculation Information page on the Office of the Commandant page. If you’ve read this blog for a while you’ll already know this next bit of information. As I mentioned in this post from 2012, the beginning of second semester is tough for all cadets, knobs to seniors. They’ve just spent close to a month at home visiting with family and friends. Coming back to cadet life, getting up early, PT in the cold dark days of winter, is a tough reality. 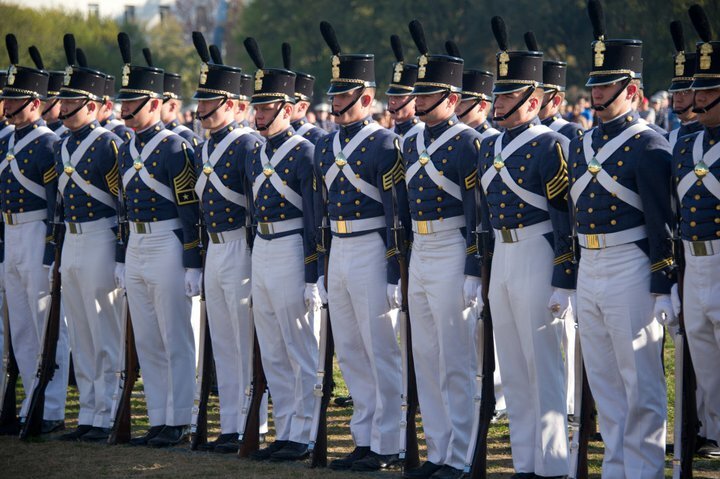 For parents of knobs, if your son or daughter hasn’t questions their decision to attend The Citadel before, January and February are the months you may field that call. If you do get “the call” remind them that they are stronger than they think they are, encourage them to talk to their classmates. Once they talk to their classmates and other friends in the Corps they will realize they are not alone. It’s still tough but they will get through it. Remind them that Recognition Day is not too far off, March 17, this year. This experience is so common the cadets have a name for it, the PG version is F’d up February. It is also tough when their friends decide for a variety of reasons not to return. If you are a family with a student who has decided to leave The Citadel, I wish you and your student the best in their next endeavors. My best wishes to all The Citadel cadets and families this holiday season. Merry Christmas, Happy Hanukkah-Chanukah, Happy New Year!! Long time followers of my blog will know I have not been updating here as often as in previous years. You see, I’ve been debating whether it’s really been helpful, or if my blog posts interfere with what The Citadel administration wants to do now that they have a parent liaison in the Provost office who updates the Parent page on the school website. To put to rest any questions I wrote to Captain Taylor Skardon to ask what he would like me to do. I offered to pass long the parent Facebook groups that I administer and to refer all parent questions to the Citadel Family Association and to Capt. Skardon. On Friday, Dec. 2, I met with Capt Skardon, Shamus Gillen of the admissions office and the Citadel Family Association staff liaison and two officers of the CFA. At that meeting I was asked to be the new Area Rep Coordinator for the CFA. The area rep position can be filled by the parent of a graduate, unlike the company and battalion reps. While the details of how this will proceed are still being worked out, I will now be an official volunteer with the school, in addition to already being the Parent Committee chair of the Atlanta Citadel Club. The basic idea is to have a working relationship to bridge The Citadel Family Association with local alumni clubs and the Citadel Alumni Association. In the months ahead more information will become available about how to get involved. Bottomline, I will now proceed with official approval. Last Spring a group of Citadel moms decided it would be fun to put together a cookbook and sell it to benefit one of the ring funds through The Citadel Foundation. The result of this volunteer effort is the “Della Delights” cookbook. “We have only 100 Della Delight cookbooks left to sell! My guarantee to you is to have them turned around within 24 hrs of payment received. The following liquidation specials remain in effect until all books are gone. I will be on Campus inside the front of the bookstore from 9AM-4PM (or until all books are gone) Jan 13, 2017. Just a little background if this is your first time reading about the cookbook. All profits from the sales will be donated anonymously, per the Funds request. My phone number is 803.412.8550 if you have any questions.